This U.S. typecase is one that was in the possession of Robert Halbert, in Texas in 1999. It appears to be a version of T.Oakley's patent case 507718 of 1893, from the information provided by William Voss at http://freepages.genealogy.rootsweb.com/~silversmiths/SalonImages/typecase.jpg. Whilst the case in the patent application is only a lower case, and the present case is a job case, it has the same unusual arrangement of lower case central boxes. These have been designed to speed up selection of the letters. 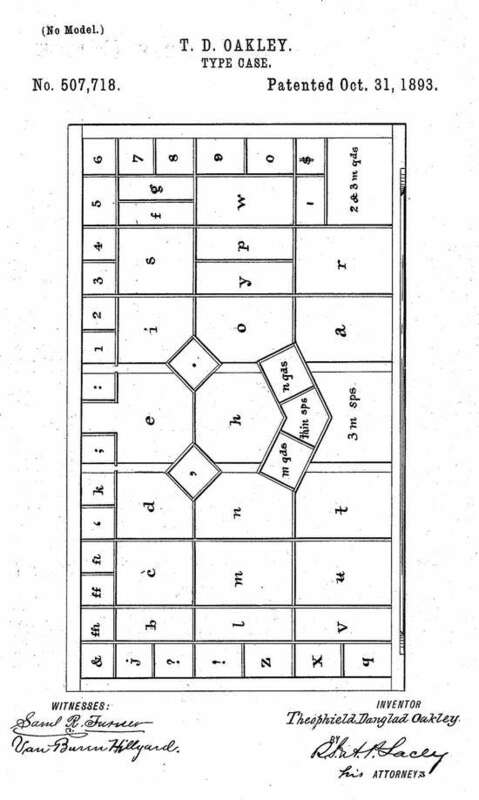 The lower case layout is shown in the patent application and also the Perfection case of 1898. This page was written in 2008 by David Bolton and last updated 1 April 2015.